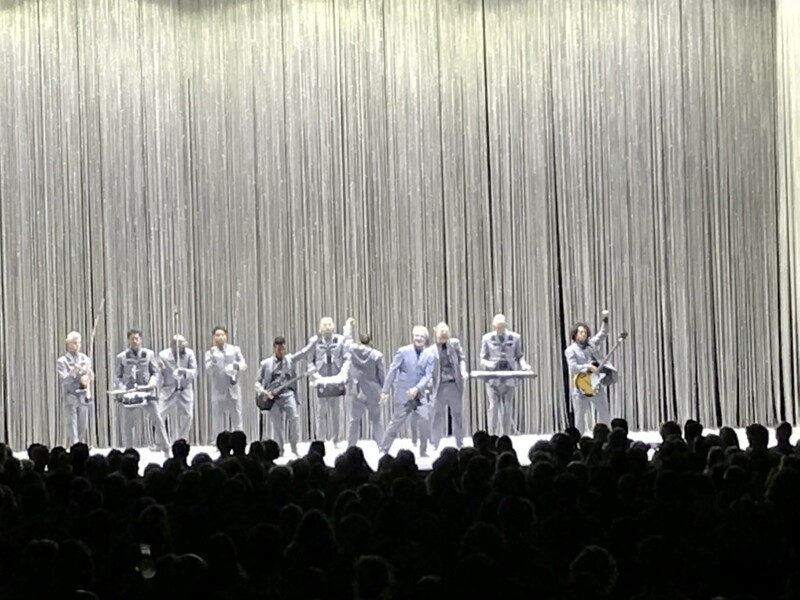 David Byrne has always been as interested in visual art as in music. So his tours with the Taking Heads became increasingly more creative performance pieces with the herky, jerky music, big suits and band movements to accompany his spiky, polyrthmic sounds. His solo tours were often just as arresting, and for the current “American Utopia” tour accompanying his first solo album in 16 years, he is breaking new ground. It was just about the last stage props put on the stage. When joined by his musicians — nine all dressed in similar grey suits and two singers — they were all fully portable. With wireless microphones, a wireless bass, wireless guitar and wireless keyboard (which provided a lot of the sound), fully half of the musicians were assigned to parts of what would be a traditional drum set – toms, snare, timbale, other percussion – as if they were ready to be a marching band. Instead of striding into the crowd in formation, though, they moved in planned patterns, stood 12-people across, or in two six-person lines, in a circle or a pinwheel in what must be the most choreographed rock concert for musicians ever devised. So unusual did it seem, with nary a snaking wire, microphone stand, effects box, amp or drum set in sight that it almost seemed like an all-dancing, little-playing track show. Byrne had to stop in the middle of the show to point out that it was not the case. Indeed, the dozen could have marched down the aisles and into the boxes, wifi willing, but chose to stay on the well lit set, which changed hue or intensity with every song. “American Utopia” got a good reading with seven of the new songs, usually delivered in two-song bursts. They fit in well with the best of his classics that he also presented because they have the same energy, the same delightfully skewed lyric approach of optimism, oddity and community. The best of them were his declarative songs that sounded like they had already been hits: “Everybody’s Coming to My House,” “Doing the Right Thing” and “Every Day is a Miracle” were anthemic sinhlongs even for those who hadn’t heard them before. “I Dance Like This,” an explication of his nerdy but infectious moves. Like a lot of leaders from iconic bands, Byrne initially sought to separate himself from Talking Heads hits early in his solo career in order to define his own path. By now, though, he was happy to share eight of the band’s best loved songs — a wealth of riches practically enough to fill a greatest hits collection. Most of them, from “I Zimbra” to “”Slippery People” to “This Must be the Place (Naive Melody)” were surprisingly reverent. “Once in A Lifetime” midset even came with the jerky original dance motions. That he closed the main set with a full bore “Burning Down the House” was almost too much to hope for. This meant some of his first rate earlier solo material from a half dozen albums had to be left out. There was just one song from his collaboration with St. Vincent, “I Should Watch TV,” which, though lighting, replicated a video screen on one end. He did the disco song from his Imelda Marcos musical, and his collaboration with Fatboy Slim. “Like Humans Do” was a welcome addition but the world could use another hearing of “Empire” at the moment, or perhaps “Strange Overtones.” There’s just a lot he could have played but they sure performed the heck out of everything they did. And they did so, it should be emphasized, while being in an entirely choreographed troupe. Byrne picked up an electric guitar only a few times; blistering, inventive solos were left to Angie Swan. Keyboardist Karl Mansfield, his keyboards loaded with old Talking Heads tunes, was left to provide much of the texture. Bobby Wooten’s bass kept a pulse throughout. It was up to Mauro Refsco to arrange the six-pier percussion deeply rooted in the Cuban, African and Brazilian rhythms Byrne has been working with for decades. But backup singers Chris Giarmo and Simi Stone went the extra step as backup dancers as well, coming up with their own crazy moves – the hand signals of frenzied air control agents and the dances of twisted Temptations. They were as fun to watch as they were good to hear. For all the prancing around, Byrne avoided precision moves, presenting instead a looser good time. The one straight cover came during the second encore, when they added to the list of murder victims in Janelle Monae’s percussive and defiant anthem of remembrance , “Hell You Talmbout.” Just about the first disheartening thing about the show came in seeing the resistance of the homogeneous crowd say the names of Treyvon Martin, Freddie Gray or Emmett Till, as requested. While Byrne was able to march into the crowd but didn’t, opener Benjamin Clementine wasn’t as well wired, but went out anyway. In his case it was a desperate move to be heard among the chattering crowd. In a city where “Stop Making Sense” still plays the midnight movie circuit and there’s at least one full-time Talking Heads tribute band, there should be no reason to miss the return trip of the real thing and its singular approach July 28 at the Merriweather Post Pavilion.